Home inspectors are now turning to using cameras equipped to perform infrared thermal imaging as a tool to enhance their home inspections. By adding infrared thermal imaging in home inspections, home inspectors can take an even more comprehensive look at defects and safety issues. Your home inspector will bring an infrared thermal imaging camera to the inspection. Using this type of camera, he or she is able to go into a home and find potential issues that cannot be seen with the naked eye. For instance, the home inspector may be able to use this camera to detect missing insulation, whereas the unaided human eye would only be able to see a wall or a ceiling. 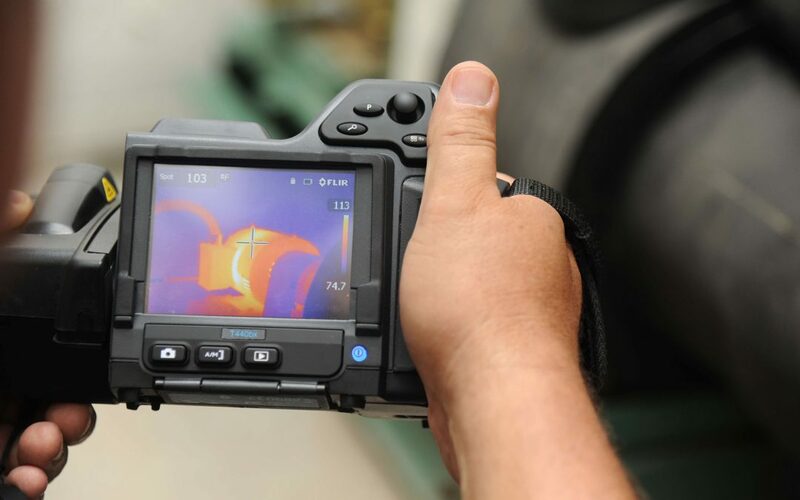 The infrared thermal imaging camera allows you to see a picture of heat disparities, which will signal to the home inspector that there may be a problem that should be explored further. This adds to the valuable information that will be given to the person who ordered the inspection. Sometimes there are hidden moisture spots that are in the ceilings, walls, or elsewhere. Leaks and moisture can come into a building through flashing penetration, porch connections to the doors, the windows, the plumbing, and more. It’s important to find areas susceptible to moisture, and it often requires infrared thermal imaging in order to be brought to light. Moisture issues must be addressed in any home because it causes an environment that is conducive to mold, decay, and wood destroying insects. During a thermal scan of the home, a home inspector will take a look at the electrical system. Infrared thermal imaging is capable of detecting electrical hotspots, if, for example, a breaker or wires are getting hot. It’s crucial to discover all those areas, and employing the camera helps save people money because areas of interest can be found before they become major problems. You may be able to avoid issues with mold, decay, wood destroying organisms, or unsafe electrical conditions. Air leaks in ductwork and insulation can also be revealed through thermal imaging, and fixing these problems will conserve energy and reduce your utility bills. If your home inspector performs infrared thermal imaging scans, consider the thermal camera to be a key tool in his or her arsenal that will be used for your benefit. Here at Cowan Inspections Group, we include infrared thermal imaging free with every home inspection. If you’re in Salt Lake City or Park City, Utah, or Evanston, Wyoming, contact us to schedule an inspection!